Coming up this weekend is Dorkcamp 2009 and I wanted to do something simple to take along. One of the themes is retro visuals for music, so a bit of analog video circuit bending seemed like a good idea. I got a Camlink 400 video mixer cheap off eBay. Turned out to be the perfect thing for circuit bending. The single sided PCB with all through-hole components is easy to work with. The circuit is pretty simple and is based around the Hitachi version of the uA733 video amp. 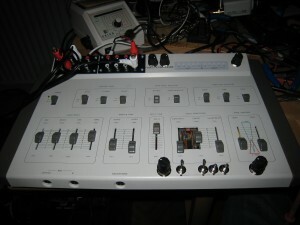 Circuit bending video is a bit trickier than with audio – you have to keep a certain amount of the signal structure right or else the display just won’t be able to sync. I put gain boosts on the effects amps and also brought some of the trim pots to external controls. This simple set up doesn’t have any way to align vsync from multiple inputs, so to allow me to overlay images I built a circuit to strip sync from an incoming signal and mix it in to the main video path. This means the incoming signal rolls as there is no sync, but it creates a good look. Lastly I put in some circuits to control the blanking used for effects on/off and the wipe functions. Combining all the new circuits with a patch panel to extract and inject signals in different places you can get some really good effects. We’re coming up to a month for Lunar Lander being on the pier. Like all things it’s had a fair share of teething troubles. The first problem was that the sound was too quiet, so the speakers and amp had to be upgraded. Other stuff isn’t proving quite so urgent. The servo motors are wearing which is giving it an bit of a judder on the rotation control. Also there is some intermittent problem between the monitor and the PC which causes the screen to go blank. Not really obvious what causes that. Anyway, not too bad for a start. In other news I build a second Cyclepong which is now in the hands of Emma Freud. My first commission!